There was not improvement in the water quality parameters that indicate the level of nutrient pollution in Dona/Roberts Bay in 2015. However, dissolved oxygen levels did increase slightly, a positive sign. Chlorophyll a, total nitrogen, and total phosphorus all increased in value; phosphorus levels are well below the target value, but chlorophyll a and nitrogen are still above their respective threshold values, causing the bay to retain its “Caution” rating from 2014. Water Quality: All three nutrient measures used in scoring water quality increased in 2015, a worsening trend. The mean chlorophyll a concentration in 2015 was .0072 mg/l, exceeding the threshold value of 0.0049 mg/l. Mean nitrogen concentration was 0.5511 mg/l, higher than the threshold of 0.420 mg/l. The annual mean concentration of phosphorus, although higher than in 2014, remained well below the threshold of 0.180 mg/l, at 0.1072 mg/l. The means for chlorophyll a, nitrogen and phosphorus were calculated as arithmetic means (per the Numeric Nutrient Criteria outlined in the Florida Administrative Code, section 62-302.532). 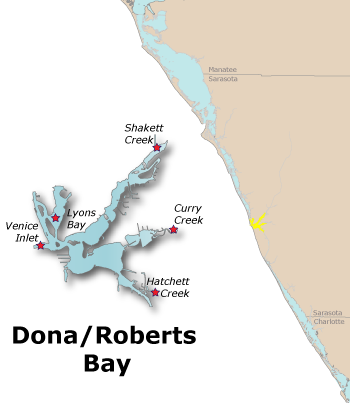 In 2014, Dona/Roberts Bay retains its "Caution" rating, with two out of three water quality measures exceeding threshold values. Biotic Indicator: Measurement of the biotic indicator, seagrass, was performed in 2014 by the Southwest Florida Water Management District. The increase in total seagrass acreage in Dona/Roberts Bay was significant. Between 2012 and 2014 it increased from 79 to 99 acres, but is still slightly below the target level of 112 acres.